As I write this, Jeff Bezos is on stage in Santa Monica, California presenting the newest developments in the Kindle product line. It’s been greatly anticipated the last several weeks and this is the time to learn what all the fuss has been about. The first reveal of the day was the update to the Kindle eReader. The newest version of this Kindle is known as the “Kindle Paperwhite”. The biggest appeal of this product is, as might be expected, improved screen technology. The Paperwhite has sharply improved contrast that everything crisper. Text will stand out more sharply than has been the case in other models as a result. It also boasts a greater pixel density than previous models. The Kindle Paperwhite’s screen has 212 pixels per inch, up from the last generation’s 167ppi. Rather than the three font options that we’ve had access to before, the new model will have six. New additions include Palatino, Helvetica, and Futura. Battery life is still the same, offering up to 8 weeks of uninterrupted use. Most importantly, the Kindle Paperwhite will have a lit screen, despite rumors about supply line issues. The light source is placed on the bottom edge of the screen itself and appears to do a great job of spreading illumination evenly across the display area. As always, this new eReader will be thinner and lighter than previous models. As Bezos put it, “It’s thinner than a magazine, lighter than a paper”. The new Kindle Paperwhite will be just $119 ($179 for the unlimited 3G model) and will be available in October, though preorders will begin immediately. The basic Kindle will also be getting a screen upgrade and a price drop to just $69. In other Kindle hardware news we get the new updated Kindle Fire. The replacement for the existing Kindle Fire will be 40% faster than its predecessor. Battery life has been extended a vague but apparently significant amount. The price has also dropped to just $159. It will be available on September 14th, explaining the sudden lack of Kindle Fires in the Amazon store this week. More importantly, we now know about the Kindle Fire HD. This will come in two sizes, as many had hoped. 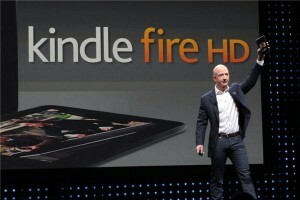 The newer, larger Kindle Fire will be 8.9” and have a 1920 x 1200 resolution. Not quite as large as the iPad, but definitely moving in on Apple’s territory. Both versions of the Kindle Fire HD will have stereo speakers to replace the mediocre sound quality of the first device. They will also have greatly improved wireless connectivity. 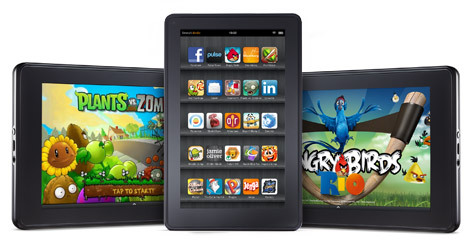 Anybody who was following the first Kindle Fire launch will remember that the device ran into trouble on many networks. This time around it will have two antennas, work on the 5GHz band, and have over 40% faster speed than the iPad’s wireless. The 7” Kindle Fire HD will be shipping on September 14th for just $199. The 8.9” Kindle Fire HD will be $299 and ship sometime in November. Both models will have 16GB of storage space at these prices. There will also be a $499 Kindle Fire HD that has 4G LTE cellular connectivity. This model will have 32GB of storage space and the data plan associated with it will run $50 per year. That meets one of the community’s big demands for the new model, so we will see how widespread adoption is. Depending on how performance holds up in actual testing, and it seems to be impressive based on presentation alone, the Kindle Fire HD might just have what it takes to build Amazon up well beyond even the 20%+ tablet market share they claim to currently enjoy. Stay tuned and we will keep you up to date on all the latest news related to this launch. The next generation of the Kindle eReader is going to have at least an optional lit display. We know that for a fact at this point. Even if previous reports of supply chain requests, patent purchasing, and “leaked” previews of the hardware weren’t enough, the no bid contract that Amazon signed with the US State Department clearly indicated that the devices they delivered would have front-lit E Ink displays. Unfortunately it might be a bit longer than we expected before we see these new lit Kindles. According to information from DigiTimes (to which all the standard cautionary disclaimers regarding their notorious unreliability apply), there have been some problems coming up in the production of their new lighting. While reports of test units have indicated that the technology works, apparently something is going wrong now that they have stepped up to mass production. This may have the effect of delaying shipments of the new Kindle eReader until late in the third quarter of 2012. Considering the fact that most people expected to see this new product announced as early as the end of July, the delays mark a major issue for Amazon’s continued investment in eReaders. At the moment, the Nook Simple Touch w/ Glowlight is the most functional eReader on the market. Barnes & Noble, Amazon’s primary competition for eBook customers in the US, came out with their own lighting solution months before Amazon was even rumored to be ready with their own. This has not stopped the Kindle from remaining the most popular eReader on the market today but even with superior customer loyalty, satisfaction, and brand recognition you can’t think they will be happy about losing any customers over the hardware side of their business. Even with these delays, there is no reason to expect the front-lit Kindle to be pushed back beyond the holidays or abandoned. Amazon is already committed to releasing such a device and it is about the only direction they could hope to improve their hardware at this point until color E Ink screens become less problematic. The biggest problems with this delay will likely be experienced by users already invested in the Kindle platform. Many are hoping that the update to the Kindle’s hardware will address some of the more common complaints in addition to offering the convenience of lighting. Touchscreen Kindles from the latest generation have not included physical controls for turning pages, unlike the Nook Simple Touch, which is one of many customer demands that will likely come up here. The Kindle Keyboard is still available and offers up all of the reading enjoyment that it ever did while not requiring the user to sacrifice screen quality, but it is also not receiving significant upgrades to its software features anymore and as such can’t quite compete with newer models for many users. Presumably the next installment will combine the advantages of both possible approaches now that Amazon has had a chance to see what worked and what didn’t when they moved the Kindle over to a touchscreen. When it comes to reading devices like the Kindle, E Ink displays are both the primary draw and the biggest marketing problem. On the one hand they allow for insanely long battery life and a reading experience as easy on the eyes as any paperback. On the other, they offer little advantage besides that ease of reading since the opaque nature of E Ink means that even optional lighting has not been possible before now. Recent reports coming out of Seattle indicate that the next generation of Kindles will finally have built in lighting. While we have not had a chance to actually play with any, the technology reportedly being employed will involve front-lighting of some sort that can be controlled through the system’s menus. This both gets around the problematic opaqueness of the E Ink material and avoids doing so in such a way as to produce eye strain like that found when reading on an LCD. This will be the first big step forward for either the Kindle or eReaders in general in quite some time. For the most part, the only think that differentiates the Kindle from its competition at this point is the integration with Amazon’s Kindle Store. Other than that the Nook Simple Touch is the slightly superior device and even the less well known competition is close enough to be comparable. E Ink Pearl has just been around for long enough that everybody who is interested has managed to adopt it. Now it is definitely cool that we will be able to do our Kindle reading in dark or poorly lit rooms after all this time. It is even cooler to discover that it won’t have tradeoffs that negate the point of owning a Kindle instead of or in addition to a tablet. Most exciting for me, though, is what this means for the generation beyond what we’ll see this year. 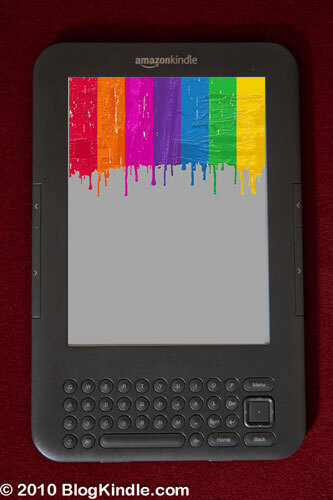 The major shortcoming of color eReaders using displays like E Ink Triton are that, unless the lighting is close to ideal, the colors are washed out and dull. Once Amazon has some experience with including front lighting and has the implementation of a lighting layer down, there is no reason to think that they would have trouble adjusting to meet the needs of color displays. This would probably result in having a color/monochrome toggle that insisted on turning the lighting on any time you wanted your Kindle to pull up a magazine, but it would still completely change the color eReading marketplace and eliminate the need for LCD reading tablets. All reports indicate that the newest Kindle generation is still in development phases while the company works on things like weight, battery life, and light quality. Even so, it is safe to assume that the Kindle 5 will show up before the end of the year. Should the Agency Model be eliminated as soon as as we now suspect it might be, Amazon will almost certainly celebrate that fact with a huge push in the product line. The coinciding release of a glow-in-the-dark Kindle would round that out nicely.